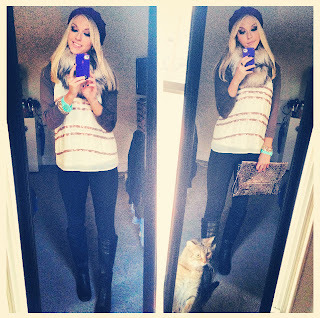 Faux Fur Infinity scarf, Target - This is so versatile and I love how it gives that bohemian feel, just a little more luxurious ;) This scarf is the perfect wintertime accent to any top, sweater or jacket. It can immediately add that "glam factor" to an otherwise run-of-the-mill ensemble. Metallic Python Envelope Bag, you guessed it, Target! - anytime I wanna dress up an outfit I leave my daytime purse at home and grab a clutch-style bag. But that doesn't mean they have to be tiny. 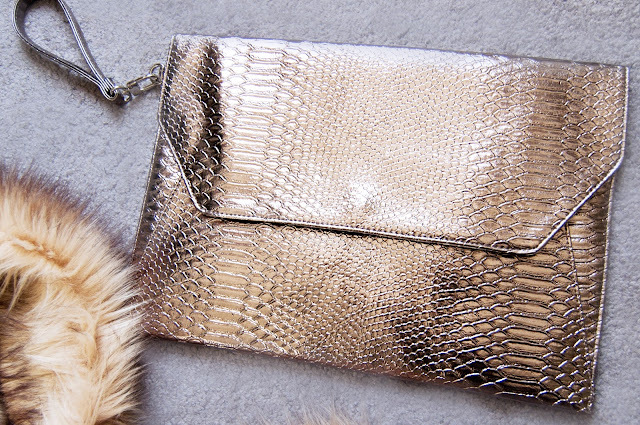 This oversized metallic python bag is still sleek making it easy to tote around with you. 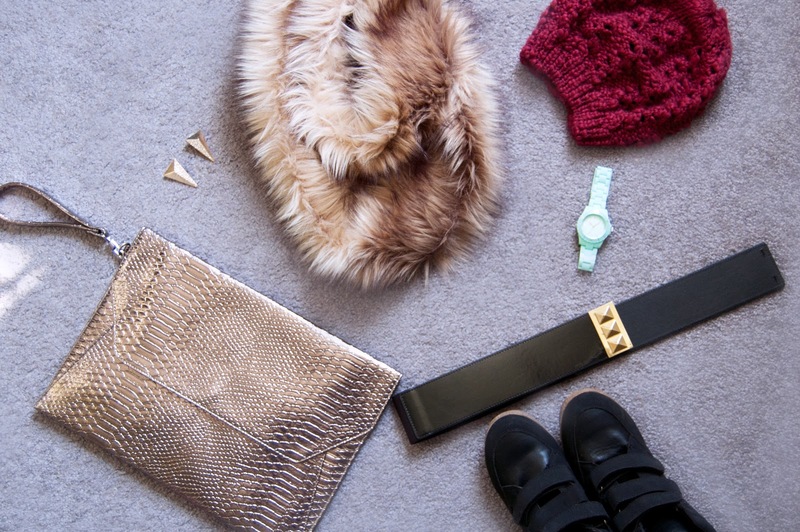 It also adds texture and shine to any outfit and the neutral color means it matches pretty much anything. 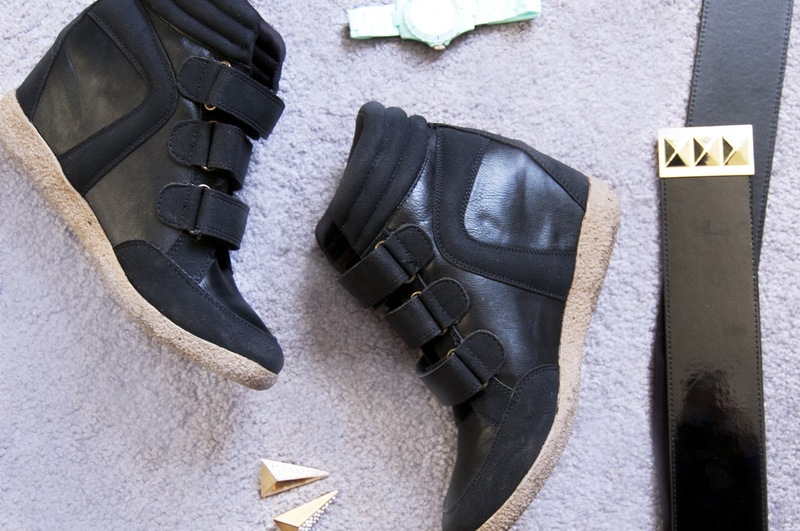 *JustFab "Keena" sneaker wedges (October Lookbook) - I've been eyeing the Isabel Marant sneaker wedges for a while but I'm not gonna lie, the price tag makes me cringe. This pair from JustFab is a much more affordable option and a dead-ringer for their high-fashion counterpart. I know this is more of an urban trend and it might not be for everyone. However, I ADORE these because I've been able to pair these babies with so many looks. Jeans, skirts, leopard print, flowey blouses, motorcycle jackets, military jackets... the list goes on and on. They also help to elongate your legs while still keeping your overall look casual and sporty. H&M studded belt - Just because, well... I love studs. A trendy belt always comes in handy. Wear it with a dress to add a metallic accent or belt an oversized shirt or sweater to take it from slouchy to structured with one little accessory. Rhinestone spike earrings, Charming Charlie (I have a blog post all about this magical place) - I've always been drawn to gold jewelry and geometric accents so naturally these earrings have been my go-to. I just love how over-the-top and fierce they are. Mint Green watch, Target - There's nothing wrong with incorporating some color into your look, any time of the year! Especially since winter clothes can get sooo serious sometimes. This candy-colored watch by the "Xhilaration" brand makes me happy when I look at it and for $15 it totally works within any budget. Thanks for checking out this post and pardon my somewhat amateur-ish photographs. I'm relatively new to fashion blogging ;P You can expect another beauty-related post from me later today! Because of the high demand for comfortable shoes for ladies, a lot of shoe companies are manufacturing specialized shoes for different activities so that everyone could enjoy a smooth ride and give their best in the activity of choice.